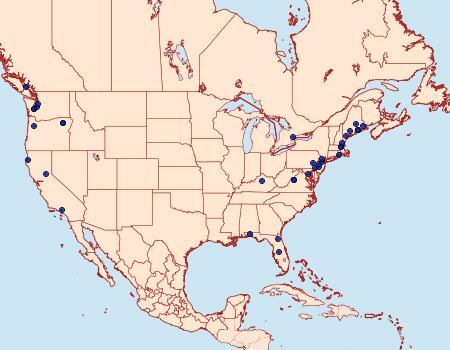 Distribution: Nova Scotia and Ontario south to Missouri and South Carolina, British Columbia south to Oregon. This Palearctic species has been introduced into North America more than once. and Size: Flight Period: May-August. 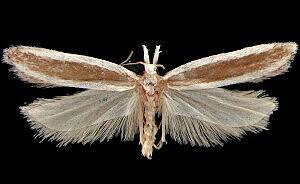 Forewing length: 5-8 mm. Host Plants: Larvae feed on Juniperus species, initially mining needles in July and later feeding externally within webbing between branchlets. 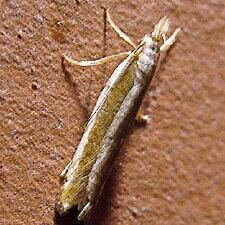 Larvae overwinter in the 6th or 7th instar and resume feeding in April and May followed by pupation in May-June. 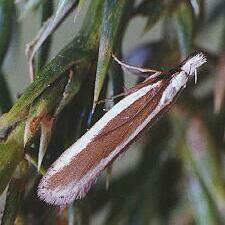 Field Marks: Forewing with white band on anterior and posterior margins, separated by a broad yellowish-brown band. Second segment of labial palpus with strong dorsal and ventral scale tufts, apex white dorsally, grayish-orange ventrally. Genitalia: Male genitalia with saccal region broadly rounded, phallus without cornutus but with sclerotized lateral lobe with simple apex. Female genitalia with antrum heavily sclerotized, corpus bursae evenly sclerotized without striae and accessory lobe. 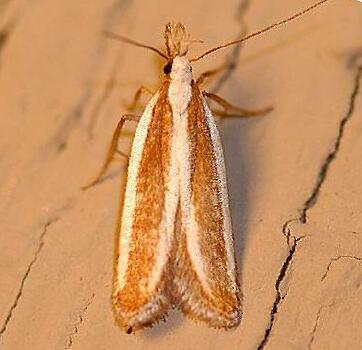 Similar Species: Many species of Dichomeris have white bands on the anterior margin of the forewing, but none have the white band on the posterior margin. 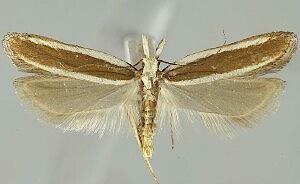 No other species of Gelechiidae has scale tufts on the labial palpus and white bands on the forewing. 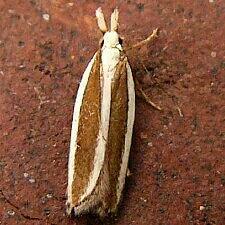 Alucita marginella Fabricius, 1781 Species Insectorum, 2: 307. Type locality: England [probably lost]. Museum Naturalium Academiae Upsaliensis. Dissertationes, pt. 6: 78. Type locality: Sweden [Zoological Museum, Uppsala]. Data compiled and contributed by SangMi Lee, Mississippi Entomological Museum from references cited.